Since it is no surprise that I’m a huge Halloween fan, it should be no surprise that my favorite ride at Walt Disney World is the Haunted Mansion. No matter how long the line, I must go on it at least once every time we go to Disney. Ray shakes his head every time. My employees I took to Disney in June thought, think I am crazy. I love it. 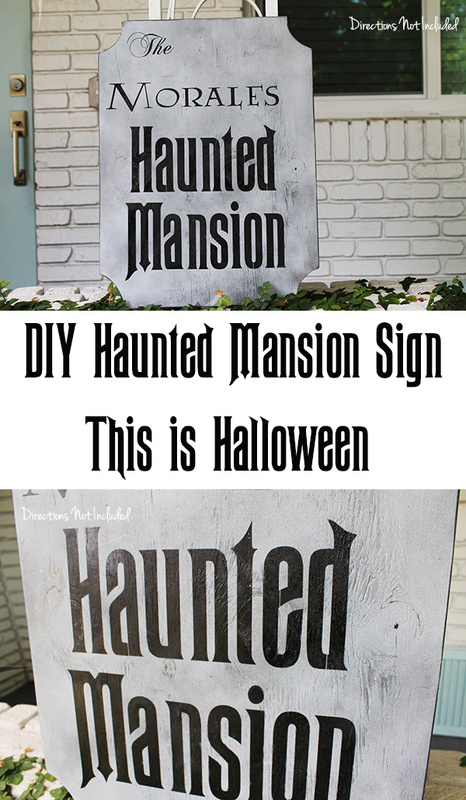 It was obviously my inspiration for our DIY haunted mansion sign. I made this last year during my delinquent blogging year so I don’t have photos throughout the process. It was pretty simple actually. I cut a piece of random plywood to the shape I wanted. I used the jigsaw and didn’t worry too much if it was completely straight or even. I used the sander before paint and after paint to my advantage and “age” the piece a bit. I used my Silhouette to cut out the stencils for the wording on the sign. 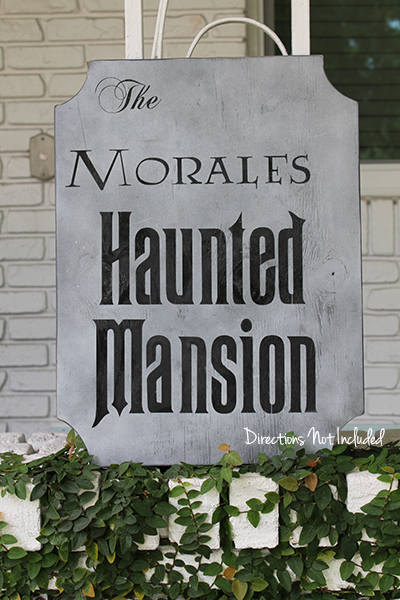 I used this font for the Haunted Mansion part since it was the closest match to what the actual sign looks like. I lightly sanded the plywood we used at first, but I didn’t work for perfection since I loved the look of the grain and the roughness. 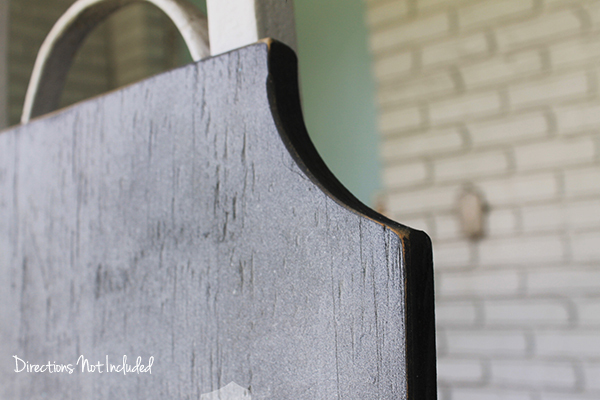 I just used contact paper and spray paint combined with acrylic paint with a brush, to get the look I wanted. I spray painted the entire board black then used silver, white, and gray spray paint to give the background a bit of dimension. I then used black acrylic plaint to fill in the stencils of the words for the sign. This is without a doubt, one of my favorite Halloween projects ever. Last year, I left it on our porch as shown above, but this year, I think we will hang it from the porch beam. I’ve done other wooden Halloween signs, but this it the one that makes me smile every time I see it. Anyone else love the Haunted Mansion as much as me? PS – Follow along all the Halloween fun on Pinterest too! 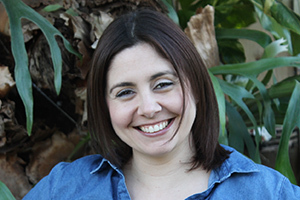 love this, anna! you know i am a fellow halloween lover! You need to let me know when you come down for that! If all works out timing wise, I could meet you there! Halloween is a fav. Thanks! I’m so excited to decorate for Halloween! Our favorite is carving pumpkins! Love the sign! I love Halloween! Such a fun time! Yesssss! The Haunted Mansion definitely has a special place in my Disney loving heart. 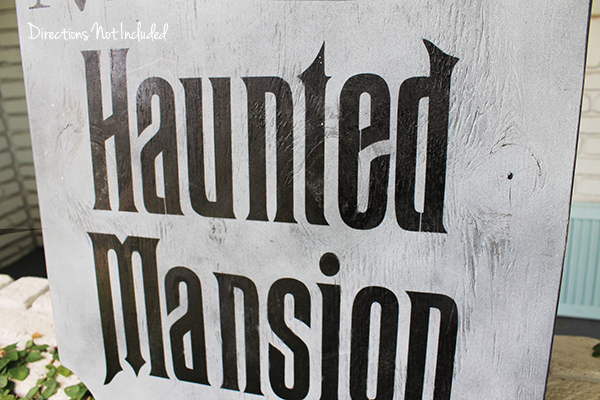 I’m working on some Haunted Mansion inspired Halloween decor right now too. Your sign is terrific! You did a perfect job aging it. Love, love, love it! Love this! Can’t wait for Halloween!